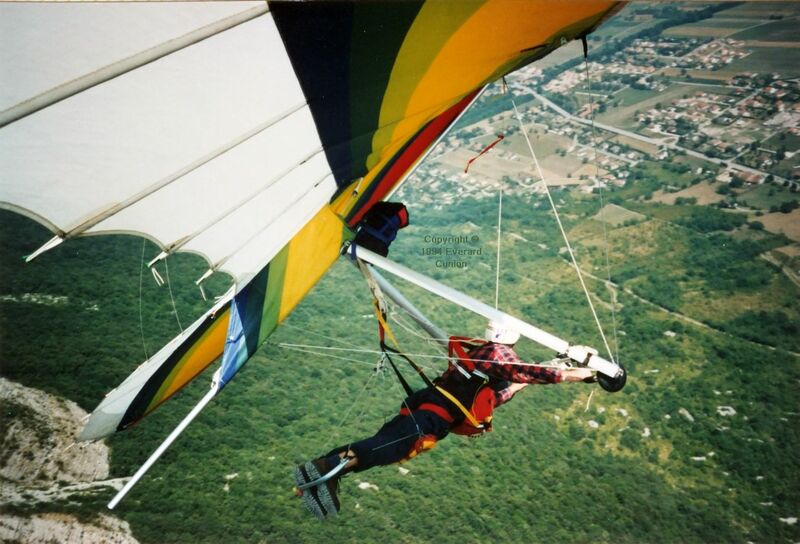 This page follows Hang gliding 1990 to 1993. In 1994 and 1995, I flew in France, Switzerland, Wales, and Spain. That subtitle is a line from Hold On Tight by the Electric Light Orchestra, 1981. It is ‘Hold on tight to your dream’ in French. It is similar to the signs on the larger launch ramps in the Annecy region warning you to check that you are clipped in to your wing. The ramp at St. Hilaire is more of a platform on the edge of the world than a ramp. Launching there is the most frightening thing I have ever done. Gordo and I emerged from the van near the rigging area at St. Hilaire in Apollo 11 fashion. Holding your nose to sound more attenuated: “I’m gonna step off the Lem now… That’s one small step for man [crackle, pause] one giant leap for mankind. [Crackle, hiss, crackle]” And I then bounded along in sort of slow motion, somehow contriving to lean backwards to slow down as though I had the massive PLSS on my back and kicking up a storm of dust in the process. 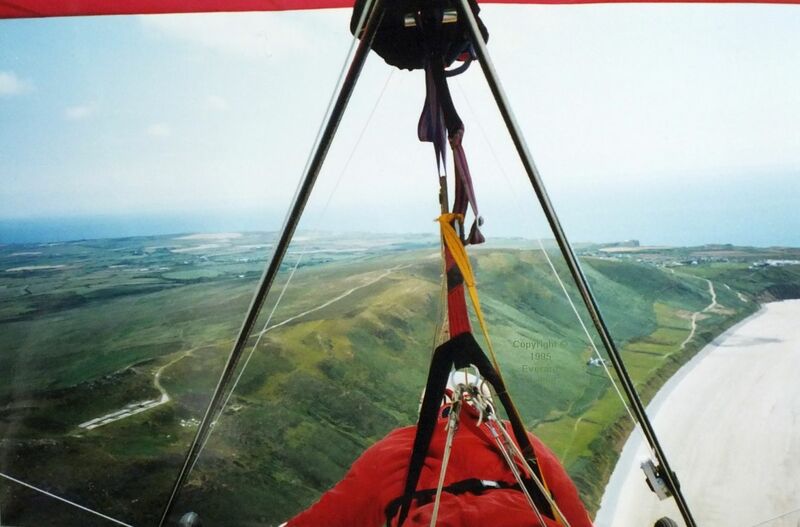 The girl friend of one of the hang glider pilots there was in hysterics. Later, she was in tears as we readied to dive off the platform on the edge of the world: The famous St. Hilaire ramp. This photo is from a flight starting in France, although much of the land below and the field in which I landed is across the border in Switzerland. 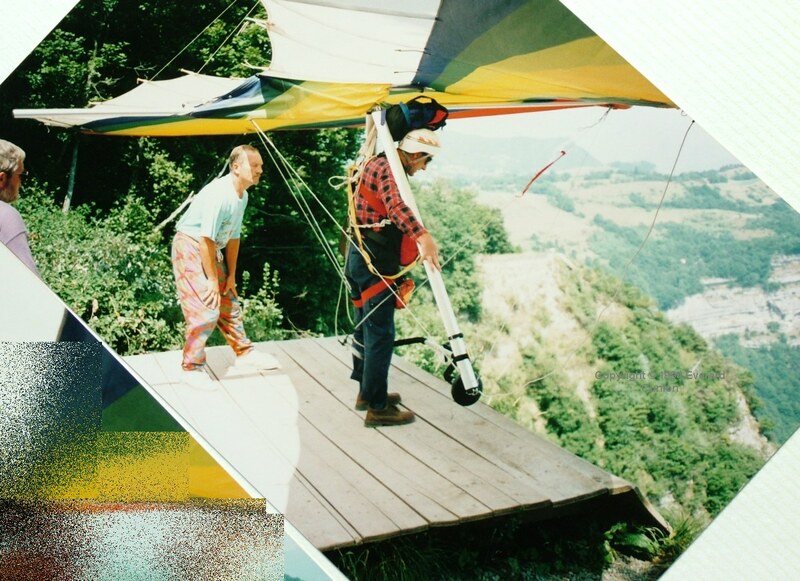 The 1988 Airwave Magic 4 was so good as an all-round performance hang glider that I continued to fly it until I bought an Aeros Discus in 2003. 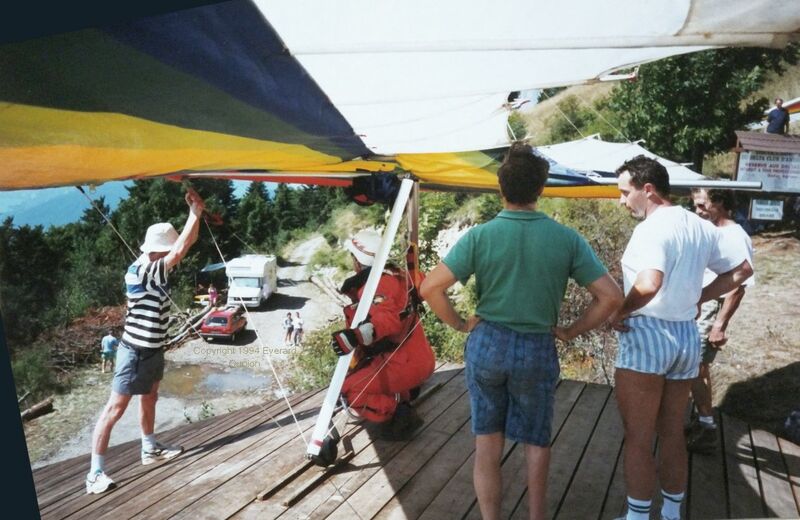 Local pilots said that the summer of 1994 provided the worst flying conditions for years. 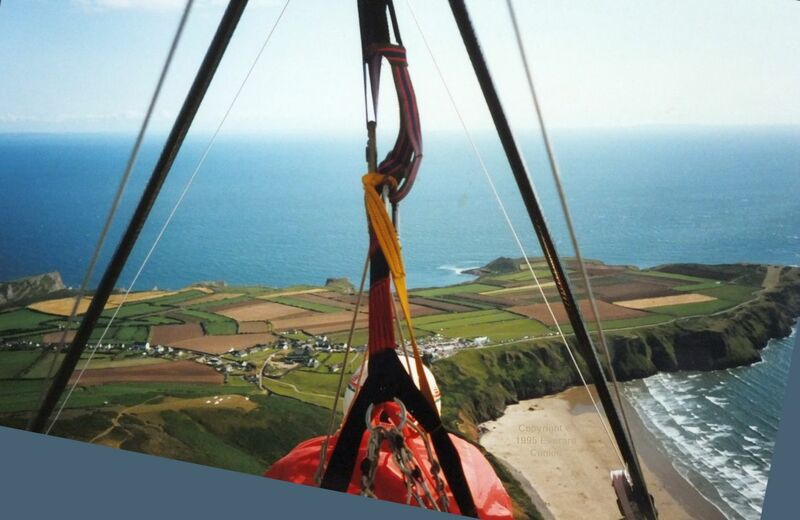 However, for those of us used to flying in Britain, it was spectacular! The Col de Forclaz includes an area near launch known as the washing machine. 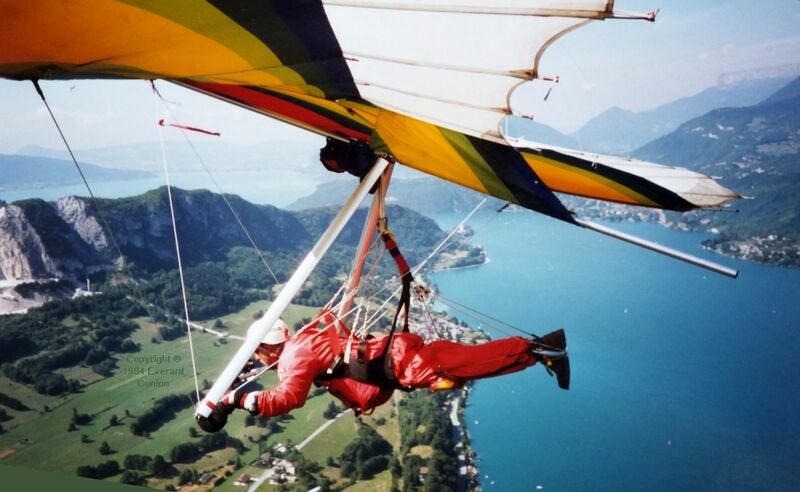 It often became crowded with hang gliders during sink cycles because, although it was turbulent, it provided good lift. On one occasion when I crossed the lake to reach the camp-site landing field, I noticed a light airplane coming towards me, somewhat lower. It was a low-wing type with a big bubble-type canopy and, as it passed underneath me, maybe 50 feet below, I noticed that the pilot was looking dead ahead. I suspect he did not even see me. Few know how difficult it is for one aircraft to see another aircraft in flight, despite Hollywood’s insistence that an eagle-eyed hero can spot his prey miles away. In real life, aircraft routinely pass within yards of one another with no one being the wiser. 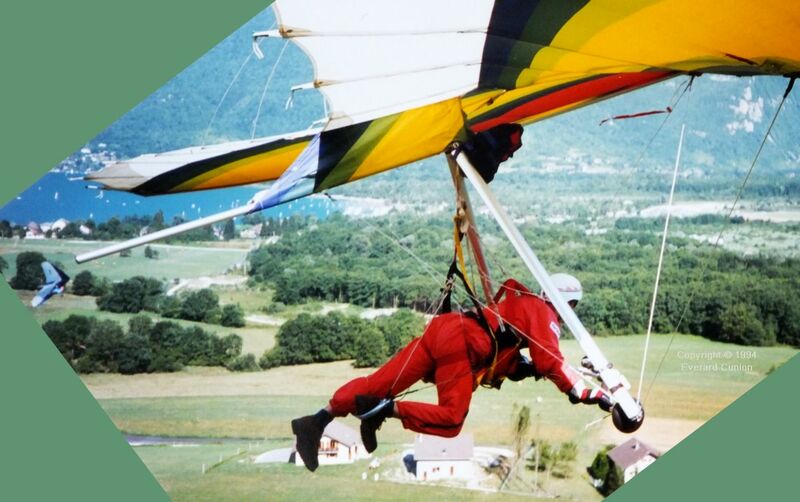 On most flights, eventually I found myself flying with no other hang gliders in sight. Then, arriving overhead the landing field, half a dozen hang gliders appeared; all trying to land at the same time. 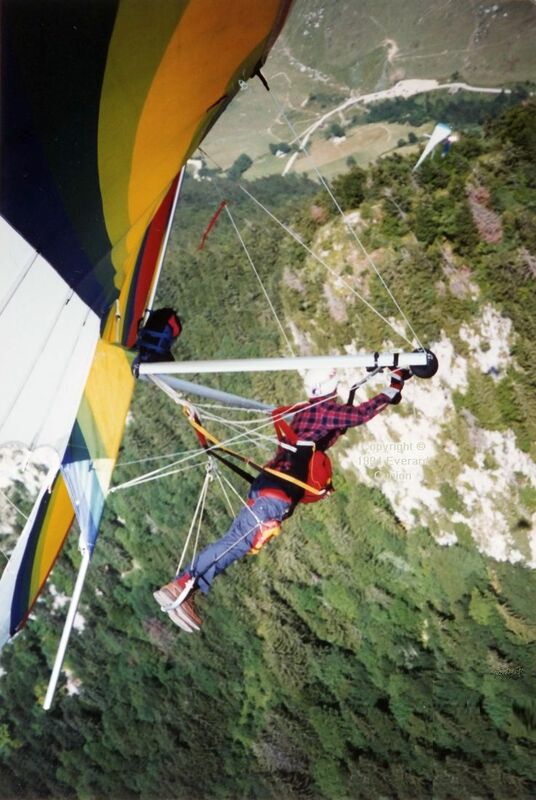 The blue wing to my left here is a Skyhook single surface glider flown by Paula E.
In early 1995 I bought a pre-owned Ultralight Products TRX 160. Its airframe is mostly carbon fiber tube. Only the keel tube, control frame base tube, and battens are metal. Even the king post and downtubes are airfoil carbon tubes. Nevertheless, it is about as heavy as the Airwave Magic IV and much more difficult to rig. 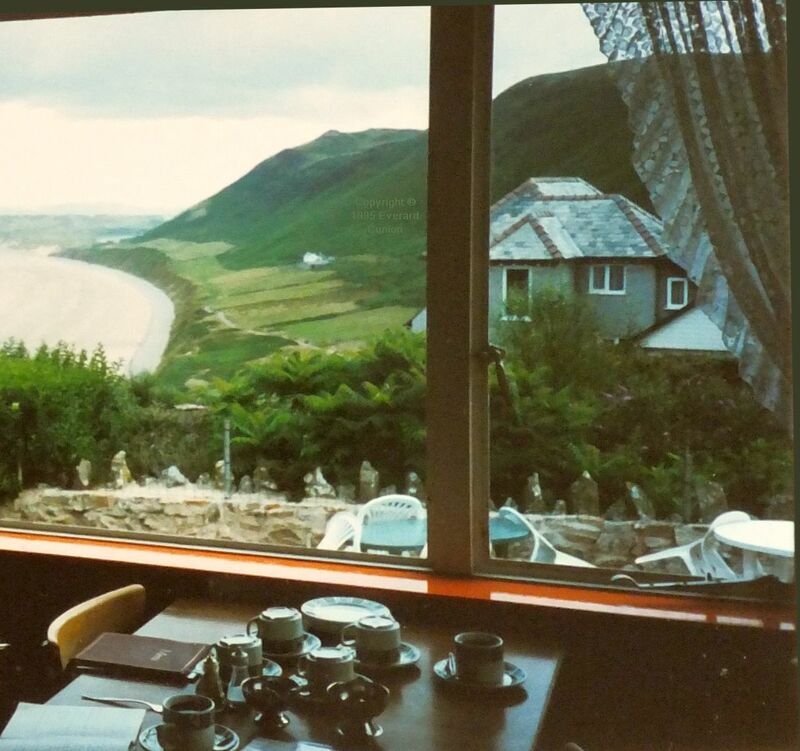 My first outing with it was in the spring of 1995 on a group camping trip to Rhossili, a west-facing hill on the coast of south Wales. I made my first prone launch here. The wind was strong and smooth. After the hang check, while I was still prone in the harness, the pilot on my front wires eased his downward pull, letting the wind lift both the glider and me. When all was stable and he was holding the wires with little or no pressure, I called for release, whereupon he ducked out of the way as I flew forward and upwards. In late summer 1995, I went again to Ager in northern Spain. I took this photo in Spain using slide (transparency) film in September 1995. Evening light is great for photography. After returning to Britain and showing my photos from Spain to my mother in the nursing home (she was semi paralysed from a stroke in 1987) I started the autumn by returning to college life. I was upgrading my HND to an honours degree in software engineering management, for which I attended the local university. Two nights later, the sky cleared and the temperature dropped to below freezing. While still dark, the sky clouded over once more and snow fell in the early morning. Before the start of a midday programming lecture, a university administrator handed him a message. 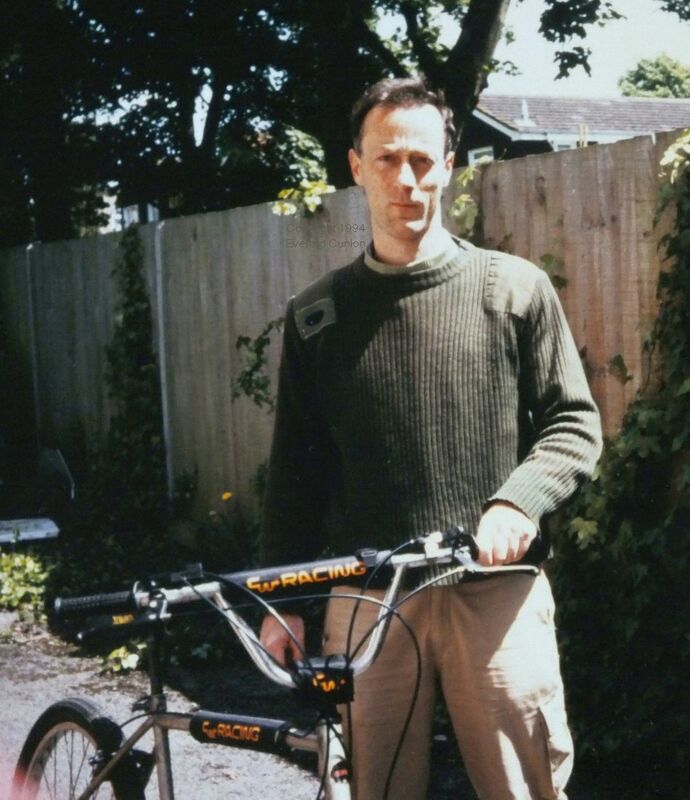 After telephoning the nursing home, he cycled there as quickly as he could. When he arrived, the nurse in charge said that they thought his mother had suffered a further stroke at 0300 that morning. One side of her face was slack. Her half-closed eyes did not move and she did not blink, but her left hand constantly reached out to grasp something that was not there. Buzz arrived the next day and, in the evening, surrounded by her new clothes and her writing pads and pens, their mother died.